Fulani Youths Association of Nigeria (Jonde Jam) has promised to deliver 11 million of their votes to President Muhammadu Buhari on February 16 presidential polls. 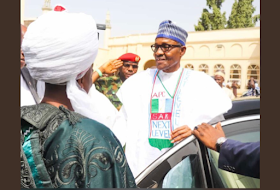 They made the promise in Abuja when their national executive committee paid a visit to the national headquarters of the APC Women and Youth Presidential Campaign team headed by wife of the President, Mrs Aisha Buhari. They were received by the national leaders of the campaign team led by the Chairman of the Central Working Committee of the campaign team, Gen. Buba Marwa. 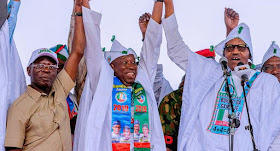 While justifying their support for Buhari, national president of Jonde Jam, Alhaji Maikano Abdullahi, said their decision to back the president for a second term was based on his antecedents and integrity. “We realise that two Fulanis are running in the presidential election but in our deliberations, we found President Buhari to be the more suitable and qualified. He is a leader with no foreign account; he has been governor and oil minister but has never stolen a kobo from the public treasury. We see him as a talakawa like us and this is why we zeroed in on him as our candidate,” he stated. The Fulani youth group said its members assembled in Abuja from across the country and would be going back to their General Assembly where they would share kolanut as a seal on their decision to deliver 11 million votes as their bloc support for Buhari. In his response, Marwa expressed appreciation for their support and urged them to go ahead and mobilise more than the 11million votes they had promised. He said it was only when they do that that the Nigeria of their dream would be realised by the Buhari presidency.